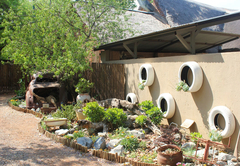 Komma Nader Guest House is a guest house with self catering option, providing accommodation in Thabazimbi for tourists visiting the Waterberg region. 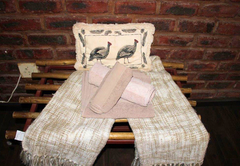 Experience the tranquil atmosphere of the bushveld at Komma Nader Guest House, only 200km from Pretoria and 75km from Sun City. 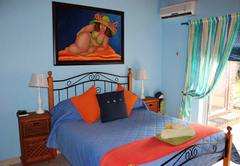 Accommodation ensures peace and tranquility within a friendly country environment. We are located 10 km outside Thabazimbi, which ensures that medical services, fuel and other commodities are close by at all times. On the terrain you can meet our large range of farm animals, as well as visit our organic vegetable garden, from which we cook our delicious meals. 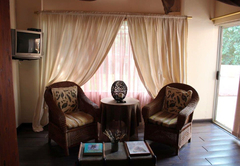 A large variety of exotic birds and different types of chickens will also give you a warm welcome. 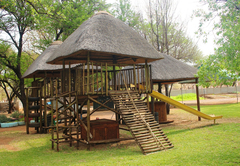 Accommodation is on a bed and breakfast basis while the cozy Komma Nader thatched restaurant and licensed bar will provide optional dinners in true bushveld style. 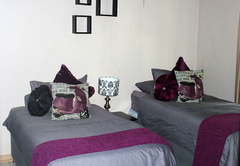 Room furnished with a Queen size bed, outside door, bathroom with a shower and a bath, air-con and DStv. 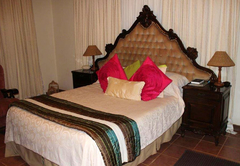 Room furnished with a Queen size bed, outside door, bathroom with a shower, air-con and DStv. 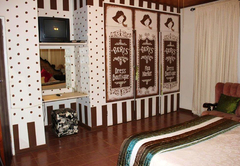 Room furnished with a Queen bed, outside door, bathroom with a shower, air-con and DStv. 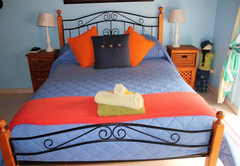 Room furnished with a Queen bed, outside door, bathroom with a shower, air-con, DStv and relax area. 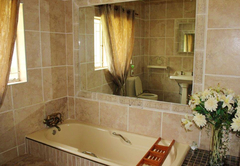 One bedroom furnished with two single beds, a kitchen, DStv, air-con, bathroom with a shower. 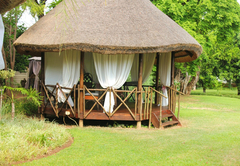 Each hut contains two single beds, a shower, coffee / tea making facilities, SABC TV and two outside kitchens. 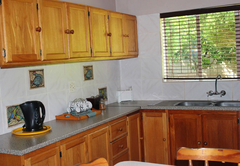 Furnished with one bunk bed, big outside kitchen, ablution block, two showers, two toilets and an outside braai area. 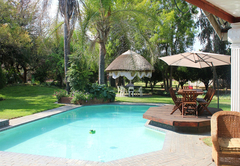 Furnished with two bunk beds, big outside kitchen, ablution block, two showers, two toilets and an outside braai area. 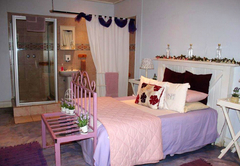 Two single beds, DStv, shower, kitchens. 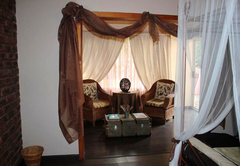 You get a room with a queen bed, outside door, bathroom, with a shower and a bath, air-con and DSTV. 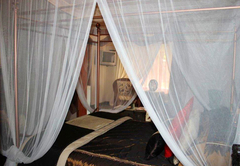 You get a room with a queen bed, outside door, bathroom, with a shower, air-con and DSTV. You get a room with a queen bed, bathroom, with a shower, air-con and DSTV. 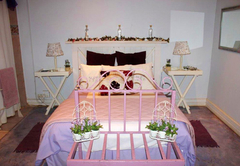 You get a room with a queen bed, bathroom, with a shower & bathtub, air-con, DSTV and relax area. 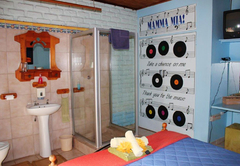 One bedroom, 2 single beds - kitchen - DSTV - air-con, bathroom with a shower. 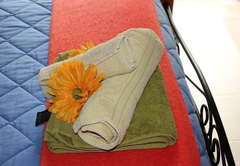 2 single beds, shower, coffee/tea making facilities in room, normal TV, 2 outside kitchens. 1 x Bunker bed, big outside kitchen, ablution block, 2 x showers, 2 x toilet, outside braai area. 2 x Bunker beds, big outside kitchen, ablution block, 2 x showers, 2 x toilet, outside braai area. 2 single beds, DSTV, shower, kitchens. Response timeKomma Nader Guest House typically responds to requests in 5-10 minutes.